In the Charlie Chan film The Black Camel (1931), Shelah Fane (Dorothy Revier) has an appointment to meet with Tarneverro (Bela Lugosi), a mystic, at the Royal Hawaiian Hotel. 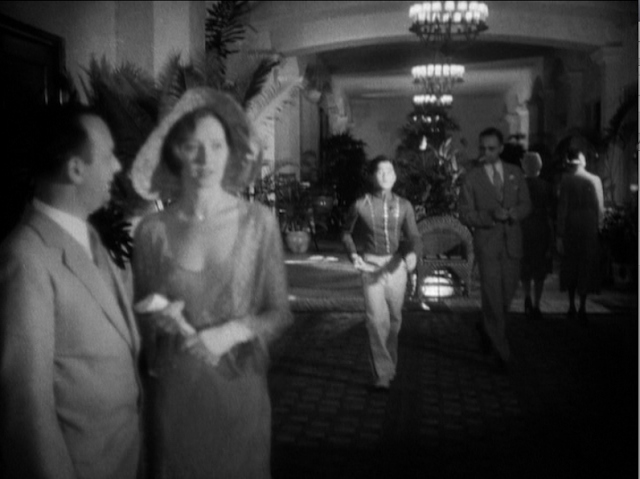 This meeting starts a chain of events that ultimately leads to Shelah's murder and Charlie Chan's (Warner Oland) investigation of the crime. 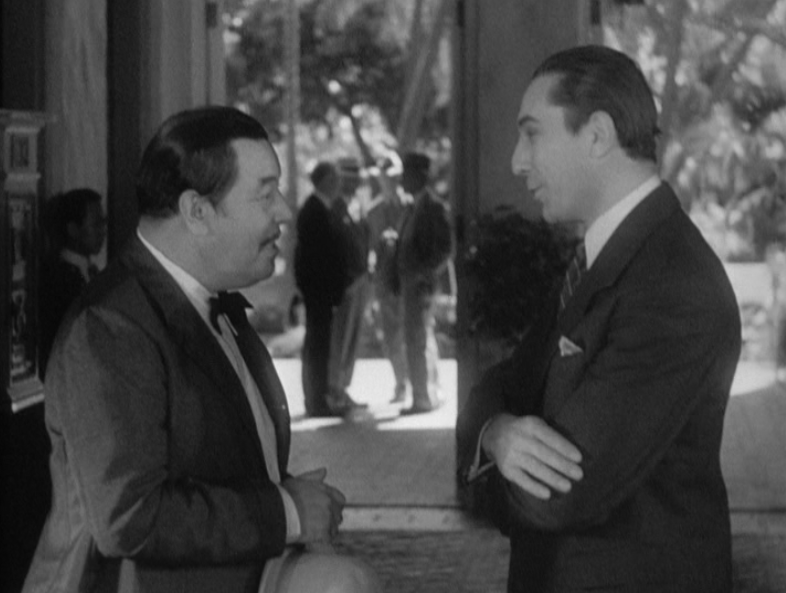 The hotel is also where Charlie Chan meets with Tarneverro to talk about actor Danny Mayo's murder. Tarneverro is meeting with Shelah Fane to talk about the same thing. And the mystery begins. 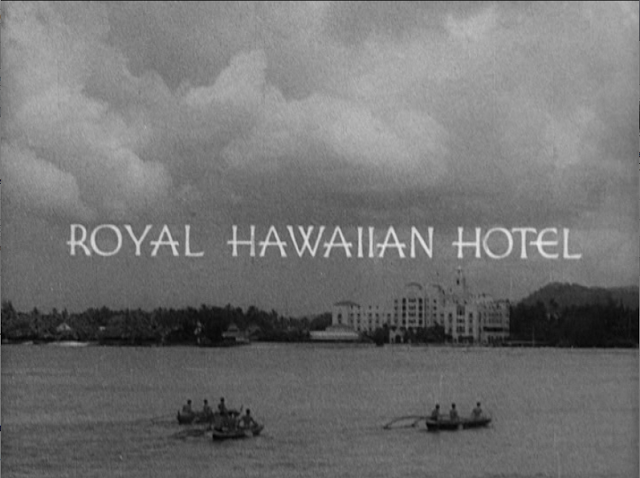 The Royal Hawaiian Hotel is one of the oldest hotels in Hawaii and was built in 1927. It's a luxury hotel that is affectionately referred to as The Pink Palace. The Royal Hawaiian Hotel is a big deal. Not only was it the filming location for The Black Camel (1931) and other films, it's also where all the major classic Hollywood movie stars stayed when they came to visit Oahu. 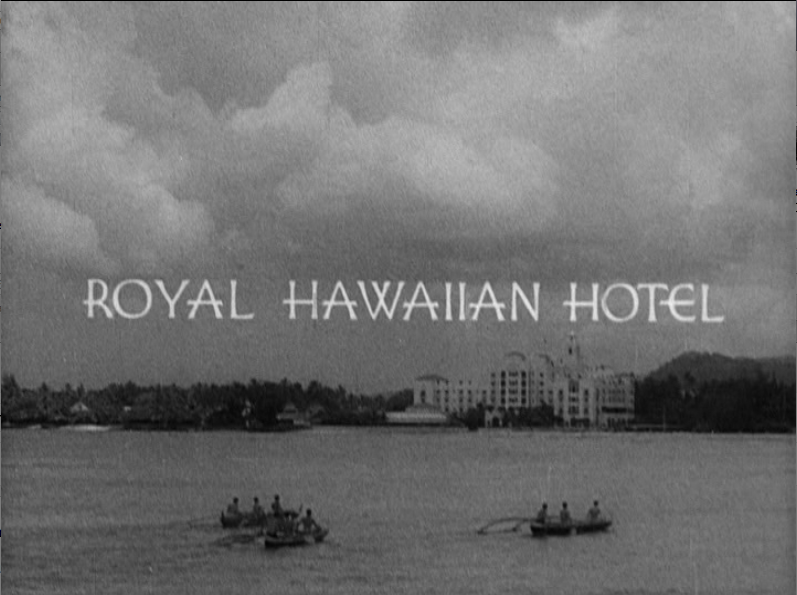 This hotel housed the entire cast of From Here to Eternity (1954) when they were filming on the island. This was definitely one of the places I wanted to visit and it's connection with Charlie Chan intrigued me more. My comparison shots are not the best because I hadn't seen the film before going to Oahu. 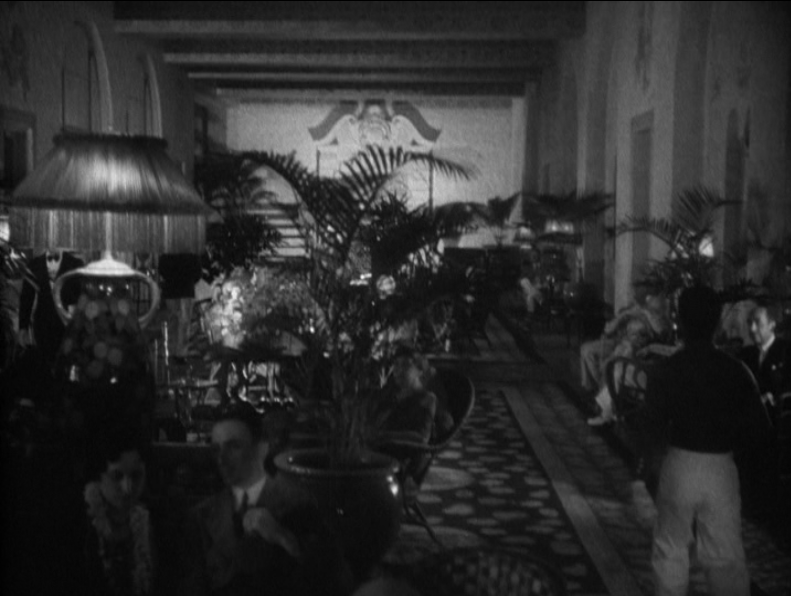 But I thought I'd still share some interior screen shots from the film with pictures I took of the lobby and patio. This is an old photograph of Charlie Chan author Earl Derr Biggers posing on the patio of the Royal Hawaiian hotel with a random guy posing as his famous character. 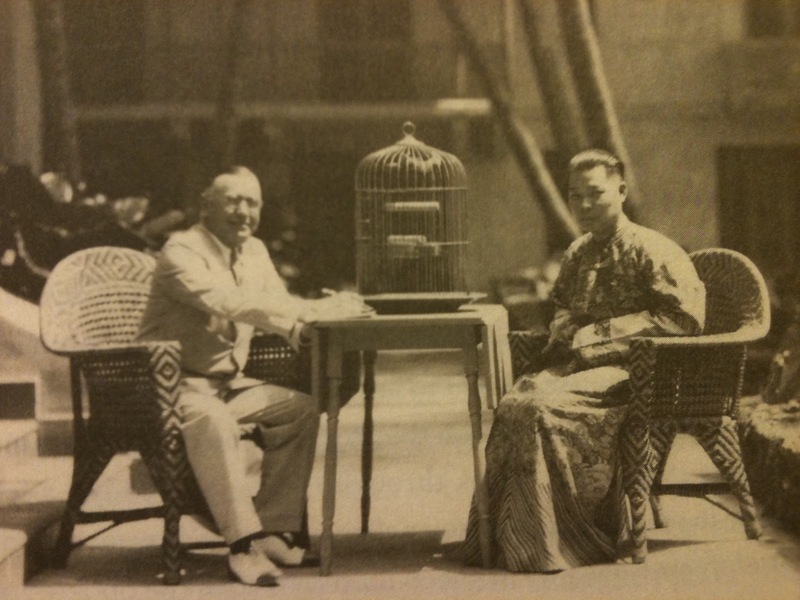 Because of the bird cage, I'm assuming this photograph was in part publicity for the Charlie Chan novel The Chinese Parrot. The Royal Hawaiian Hotel is absolutely stunning. If you are ever in Honolulu, just wander through the lobby, the patio, the garden in the front and the path leading to Waikiki Beach in the back. If you have a lot of cash burning a whole through your pocket, stay there! Don't worry. Carlos and I didn't get arrested! The last Charlie Chan location I would like to talk about is the Honolulu Police Museum. Why yes. I went to a police museum on my honeymoon. I'm lucky to have married Carlos because he thought it was really cool (and not very weird) that I wanted to go to this museum. Not only that, he ended up having more fun there than I did! So why the Honolulu Police Museum? Because they have a Chang Apana - Charlie Chan exhibit of course! An early portrait of Chang Apana, the detective who inspired Earl Derr Biggers to create the Charlie Chan character. The Honolulu Police Museum is a one room museum located within the Honolulu Police Headquarters. You can visit any weekday from between the hours of 9 am and 3 pm and you can request a tour. We opted to just browse the museum on our own. Entrance to the museum is free. You just need to be screened before entering the building. We left a donation for one of the Police Department's charities. The museum had all sorts of cool stuff including badges, photographs, detective gear, uniforms, etc. The Chang Apana/Charlie Chan portion of the exhibit was small but a good size in comparison to the museum as a whole. It featured lots of photos of Chang Apana as well as some Charlie Chan memorabilia including a first edition copy of House Without a Key, the first Charlie Chan novel. On the right you'll see Chang Apana's leather horsewhip which he often used on criminals he captured. Apana was a cowboy when he was younger and his experience wrangling cows and horses helped him do the same with criminals later on. It was fun learning about Chang Apana and all the other detectives and police officers from Honolulu's past. I hope you enjoyed my three-part series on Discovering Oahu, Hawaii with Charlie Chan. "Enjoy" hardly covers it. I think I'll return often to your enchanting series. How cool that the police museum has an exhibit related to Charlie Chan! I wonder how many tourists to the island miss this exhibit or don't have the classic film interest to appreciate the exhibit? Great pics of the hotel too.